Apple's cloud-based file-syncing and storage offering, iCloud, is among the most popular members of Cloud storage family. This service mostly concerns itself with Apple apps and devices, but you can also use it in a Web browser and a non-Cupertino-designed computer. With this service, you can save any files you like to the Cloud, and then these files will be automatically synced to all devices you sign up iCloud. Then you may ask a question: Can I transfer my DVD collection to the iCloud? The answer is: Yes! Here the list of top DVD to iCloud Converter for Mac will help you backup DVD to iCloud for storage. Why Do We Backup DVD to iCloud? Below information will show you why we need a DVD to iCloud converter to backup DVD to iCloud. 1. DVDs are trapped on physical platters. When you want to watch DVD movies, you have to find the disc, slide it into a DVD player, or a computer with a DVD drive. However, if the DVD is not at near hand, you will have no access to DVD contents. So, backup DVD to iCloud is very essential, so that you could effortlessly access any lyrical songs, amusing videos or Hollywood blockbusters on DVDs even if DVD is not at near hand. 2. DVD discs are fragile and can easily broke off by children. Copying DVD to iCloud with the DVD to iCloud converter will frees you from the troubles of disc loss or damage. 3. Once you convert your DVD contents to digital files and then upload them to iCloud, you can stream them anytime, from anywhere. You can Play DVD movies on Macs, iPads, iPhones, Game consoles,etc as long as you login in iCloud account on your device no matter you are at home or on the road. It has so many advantages, however, it is obvious that DVD discs cannot be directly put into iCloud. So we need to rip DVD to iCloud compatible video files with the help of professional DVD to iCloud converter and then upload the generated DVD videos to iCloud. This article is to teach you how to rip DVD to iCloud on Mac with several methods. It would be very easy to rip DVD to digital video formats for uploading to iCloud, as long as you get a decent DVD to iCloud converter. 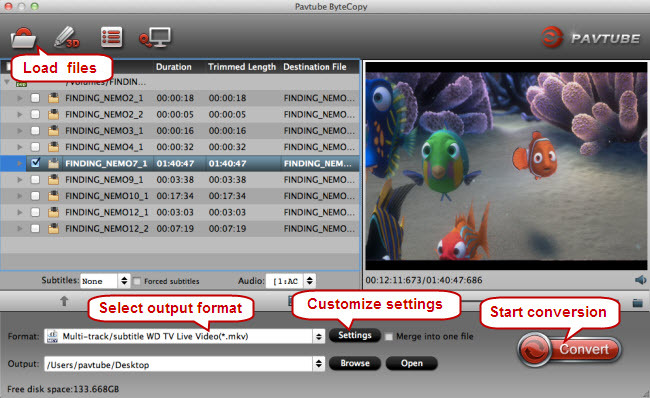 Here the Pavtube ByteCopy for Mac come to your rescue. As we all know, most commercial DVDs are encrypted to protect its copyright, making it tough to copy DVD to iCloud. Luckily, this top DVD to iCloud converter for Mac is constantly upgraded to convert any copy-protected DVDs, like Beauty and the Beast, Guardians of the Galaxy. It just takes a few minutes to bypass Region Code, Disney x-project DRM copy protection, CSS, Sony ARccOS, etc. This software lets you convert DVD	to popular digital video format MP4, MOV, MKV, AVI, etc. for storing to iCloud and playback on portable devices speedily while keeping the original quality untouched. You can also refer to its windows version to rip DVD to iCloud on Windows 2003/XP/Vista/Windows 7/Windows 8/Windows 10 as you like. Just download it and follow the guide to backup DVD to iCloud. Launch the DVD to iCloud converter software, click "Load from disc" icon to load DVD disc into the program. DVD Folder, DVD IFO File, DVD ISO Image File, Blu-ray Discs and Blu-ray Folder can also be loaded. Apple iCloud has no specific requirement on the file types uploaded to it, so just choose the output video format depending on your ultimate device to play DVD movies. Just click "Format" bar and choose your desired format. You can choose "MP4" from "Common Video" or "HD Video" category, which is a popular format that keeps a good balance between video size and quality. If you want to enjoy DVD movies on your iPhone, iPad, you can directly select a decent format from "iPhone", "iPad" category in the format list. Plus, Pavtube ByteCopy for Mac also supports converting DVD to 3D SBS MP4, MOV, MKV for you to enjoy vivid 3D effects on Samsung Gear VR, Google Cardbord, and so on. Tip: After selecting your desired file format, you can press on "Settings" to adjust and edit more detailed information of the output DVD movies including video codec, video bitrate, display ratio, frame rate and other settings to get best video/audio quality. This program also offers a built-in video editor, you are able to create personal movie by trimming part of whole movie, cropping black bars, inserting SRT subtitles, adding watermarks and special video effects. Just click "Edit" icon on the tool bar, you will quickly find all edit options you need. Click on the big red "Convert" button to start the conversion process. Once the conversion finished, you can click "Open output folder" to popup output directory with the converted DVD movie files. Besides Pavtube ByteCopy for Mac, there are many other free DVD to iCloud converters are worth trying, such as Handbrake and MakeMKV. Follow the next guides to see how to backup DVD to iCloud with Handbrake or MakeMKV. How to rip DVD to iCloud with Handbrake for Mac? 1. Click "souce" and simply choose the DVD you wish to rip from the drop down menu. Warning: Handbrake only works with the DVDs that DO NOT contain any form of copy protection. If your discs are encrypted with CSS or region code, you'd better install Handbrake libdvdcss on Mac/PC. 2. Click the "Browse" button to choose the path where you want to save the output file in. Then Click "Save". 3. Go to "format" drop-down list. You are allowed to use Handbrake for Mac to rip DVD to MKV or MP4, choose one and then click "Start" icon on the tool bar to start DVD to MP4 or MKV conversion process. Have issues with Handbrake on Mac, turn to a Handbrake alternative instead. How to convert DVD to iCloud with MakeMKV for Mac? Unlike HandBrake For Mac, MakeMKV for Mac includes its own set of decryption tools. Here's how it works. 1. Download and install MakeMKV for Mac. 2. Put a DVD movie into your DVD drive, and click the DVD button in the middle of the screen. 3. MakeMKV For Mac will scan the disc to identify the titles to rip. 4. When the software is done, select the location for your movie in the Output Folder menu box, click "Make MKV", and wait for a few minutes. However, be aware that the output file is only in the MKV file format, and it won't be played anywhere. 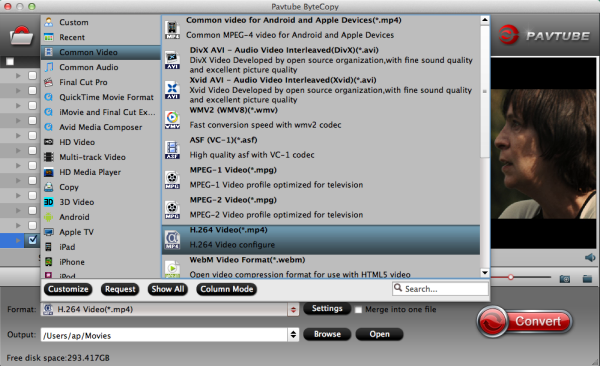 Need more output formats, just turn to Handbrake Alternative. How to upload generated video files to iCloud? After getting a common digital video file from DVD with the top DVD to iCloud converter for Mac, just follow the next steps to upload video files from computer to iCloud. 1. Hold "Control", click the video file and compress it to a .zip file. 2. Change the extension of the file from .zip to .txt as before. 3. Go to iCloud on your web browser, log in and go onto iWork. Upload the .txt version of the video file. 4. When this has uploaded, go to iCloud on your other computer and download the .txt file. When it has downloaded, locate it in your downloads folder, rename it by removing the .txt extension and replacing it with .zip (so converting it back to a .zip file) and double click the file to open. One thing to be aware of is that iCloud doesn't give visual warnings of how full your cloud is and so it can be particularly easy to reach your data limit using this method. 2. Tap "Settings" on your iPhone. 3. Tap "Network" button to connect iPhone to Wi-Fi. 5. Move the slider from left to right to turn ON "Wi-Fi". 6. Go to https://www.icloud.com/ & sign in to your account. If you don't have an account, then create one. 7. Tap "Settings" on your iPhone. 9. A "Storage & Backup" window opens up. 10. Move the slider from left to right to turn ON "Back Up to iCloud". 11. Tap "Back Up Now" button to upload videos from iPhone to iCloud. How to Get Blu-ray Playback on macOS High Sierra iMac/MacBook (Air/Pro)/Mac Mini/Mac Pro/iMac Pro? How to Copy Blu-ray on macOS High Sierra? How to convert your DVD to MP4 on Mac?